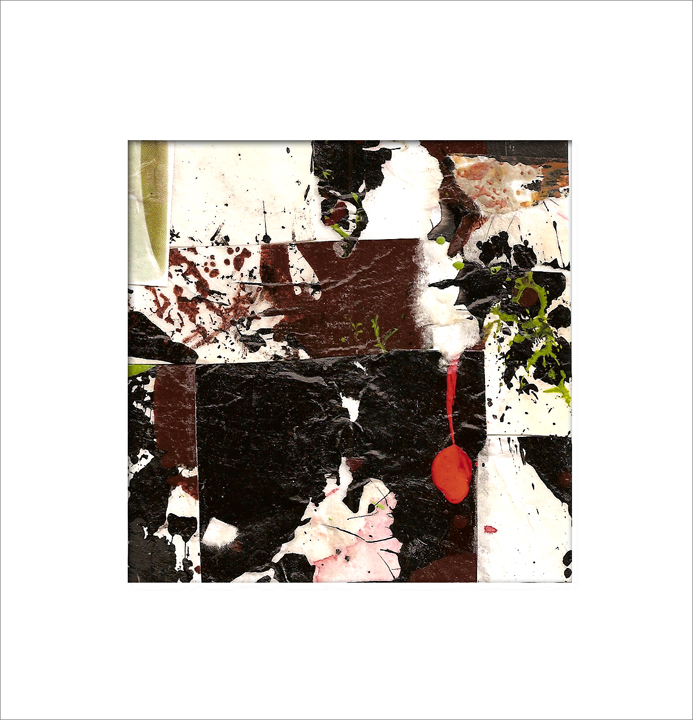 This little collage was made from layers of a piece of mat board that I had been using for a squeegee. I peeled the surface off both sides of the mat board to use as collage pieces. Since I love to recycle everything, I save all of my mat board squeegees because the paint blobs become really interesting over time. 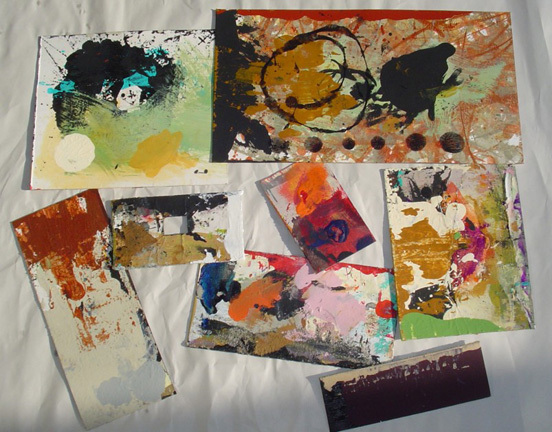 They can be scanned and printed as collage pieces, used as studies for original abstract paintings, or incorporated into collage. Here’s a collection of them from a couple of years ago. Itaya, I am so tired of the waste that we all create and then have to deal with. So now my mindset is always about how I can reuse, or recycle, or be as low-tech as possible. I know! Those paper towels are pretty darned cool! Thanks Gina – Everything is potential art materials around here! Martha…that piece is really nice! But, not being a ‘real’ artist – I don’t know what a matt board squeegee is. Can you tell me? Are they paint skins? Sherrill, it’s just pieces of mat board, usually scraps, that I save and use as squeegees when doing my bigger paintings. When I’ve used one, I just wipe the excess paint off with a paper towel and use it over and over. Wonderful idea and look….also love the foto with all of them spread out like that….looks fantastic! I love painting/assembling with “leftovers”.